I wasn’t planning on doing this. As Mass continued on Wednesday night for the Feast of the Assumption, I felt like God was asking me to consider talking about this painful subject. Sometimes working in ministry people look to you to have the right words. It can be as simple as a prayer, but it can be as difficult as the right thing to say at a funeral home to a grieving friend. I have learned there are no perfect words or things to say. I have tried to be present with people in their suffering and don’t try to find the ideal thing to say. Today I find myself at this moment again. I am still at a loss for the perfect response because of the magnitude of this tragedy in the church, but nonetheless, I feel confident we need to stand up. 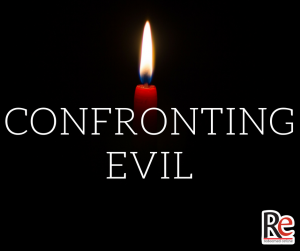 We need to confront evil. We need to be authentically Catholic in the midst of what’s happening today. My words fall short from a perfect response, but we must respond. We must continue to bring light to the darkness. Here’s this week’s #ShareJesus video – Confronting Evil. Please feel free to join in the conversation in the comments here on our website, Facebook, or YouTube. If you are not doing so already, please also pray for our Church that Christ’s light would dispel all the darkness. Spiritual Warfare is not an analogy. Spiritual Warfare is the Christian life. 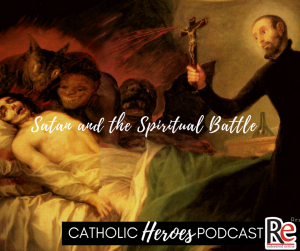 This week we wrap up our discussion of “Rejoice and Be Glad” and talk about St. Francis Borgia. Thank you, Josh. So well stated, yes, we need to confront evil. If we don’t stand up for what is right and bring evil out into the open EVIL WINS!!!! Praying for our church.